Last week, Salesforce CEO Marc Benioff touted a vision of the future in which everything and everyone will be connected and driven by machine learning and data. Benioff was launching his company's foray into artificial intelligence last week in front of 170,000 people at its annual Dreamforce conference in San Francisco. 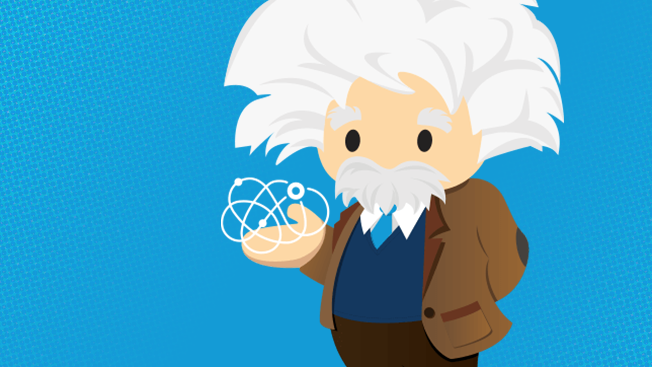 While the future-looking technology has been in the works for years and was built by hundreds of data scientists, Salesforce's AI tool actually takes a branding lesson from the past—specifically, from Albert Einstein. Salesforce unveiled Einstein in September and at Dreamforce explained how it works. Here's the gist: Salesforce is plugging AI into all of its products—including email, mobile and social media—to make them a little smarter the more you use them. For instance, Einstein's algorithm-based learning can anticipate which emails customers are most likely to click on based on the recommended products they promote. Einstein can also flip through photos and videos to see if they are relevant for a brand, analyze how people use apps, and predict the best time to send a piece of marketing. Under the tagline, "AI for everyone," Salesforce's branding for Einstein entails an Albert Einstein cartoon character and the Einstein name that's being used in the company's business-to-business advertising. And there's an interesting backstory behind that name. In June, Salesforce started talking to Greenlight, which is owned by Branded Entertainment Network, or BEN, about acquiring some of the assets associated with the iconic scientist. "Albert Einstein globally represents creativity, innovation and you've got a huge global audience about innovation, genius and creativity—Salesforce can immediately tap into that brand recognition and not have to start from scratch," said CEO Gary Shenk of BEN. On Facebook, Einstein has more than 19 million followers, with another 66,500 on Twitter. And on Instagram, 524,000 accounts follow his posts, which often make pop-culture references or relate to history. #KenBone has become an overnight sensation after last night's US presidential debates. However, we must ask, who wore the mustache better: Ken or Einstein? Greenlight represents the rights for such icons as Elvis Presley, Muhammad Ali, Charlie Chaplin and Steve McQueen, in addition to Einstein, and works with brands to find ways to incorporate the personalities into advertising. "It could be a piece of news, rights, a film or TV clip or anything iconic that they want to use in their marketing or product development—that's one line of business," Shenk explained. "In the second line of business, we actually represent properties, so in that case, we work for the estate or the celebrity themselves." In the case of Salesforce, it's a little bit of both. Greenlight worked to license the Einstein character and name from the scientist's estate, which is owned by the Hebrew University of Jerusalem. "With its emphasis on artificial intelligence and predictive nature, [Salesforce] saw the value in tying the brand to Einstein," said Lisa Soboslai, vp of branded integration at BEN. "They were looking to license both trademark rights—so the right to name the product Salesforce Einstein—and then they also wanted to license Albert Einstein's name, quotes, primarily in B2B advertising." A number of other brands—including Einstein Bros. Bagels, Disney and McDonald's—have associated themselves with Einstein. Soboslai offered this advice for brands thinking of working with cultural icons or celebs: "The more authentic the connection between the brand and the personality, the more it resonates with their consumers."